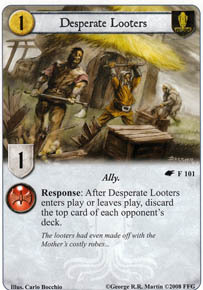 Response: After Desperate Looters enters play or leaves play, discard the top card of each opponent's deck. Stupid question. Things of this sort, "When X enters play", does that apply during setup? Also, if you played a card during setup that said something similar, but was "when this card is played from your hand", would that trigger? Again, I would assume not. Found the answer and I had it right apparently.